First released during the Atlas of the Ancients Plot, Cloud Raiders calls YOU to captain a flying ship travelling from Faerieland to Terror Mountain. Using air currents to guide your ship, navigate through the sky avoiding trees, clouds, birds and enemy ships to reach your destination safely. This game is played entirely with your mouse. In order to steer the ship, you will need to make air currents by clicking and dragging your mouse in the direction you would like the ship to go. The steeper the slope, the faster your ship will move. However, if the slope is too steep then the ship will come to a complete halt. This can be helpful in avoiding certain obstacles, but we would only suggest this as a last resort. Above your game screen you will also notice a toolbar. This tells you all the important things that are going on in the game. The bar next to the heart is your health. If your health runs out your ship will crash and the game will be over. The blue bar concerns your air currents. Note that you cannot draw a continuous line. This bar tells you how long you have left before your air currents run out. They will start to replenish either when they run out completely, or you take your finger off the mouse button. The blue button is VERY useful and turns off extra scenery and animation to avoid distraction. The red button is the 'end game' button, but can also act as a pause button. Though the controls may take some time to get used to, once you do gameplay is fairly simple. The game consists of three levels which are the same every time. Thanks to this, being an expert at Cloud Raiders is hardly difficult, the more you play, the more familiar you will be with the level construction. There are, however, a few more things you should know before you begin. Points are scored by collecting coins, which is done by simply running through them. You will only collect coins if the body of the ship catches them, not the sails. This is the same with enemies; they will only decrease your health if they touch the body of the ship. Air currents work best if directed from close to your ship. It makes the ship easier to control. However, if you happen to be a super-speedy-air-ship-piloting-machine, you can draw your currents in advance. This is only recommended for air-sailing experts as it gives a lot more room for mistakes and makes them harder to correct. It is more important to keep your health bar full than it is your pocket. Focus more on collecting health than coins, they will come much easier. To keep the best control of your ship, try to keep it centered. Hitting either the top or the bottom of the screen will make you lose points. Also, if your ship remains in the middle of the screen it will be easier to dodge the trees and towers. In exception to the previous rule is level 2. 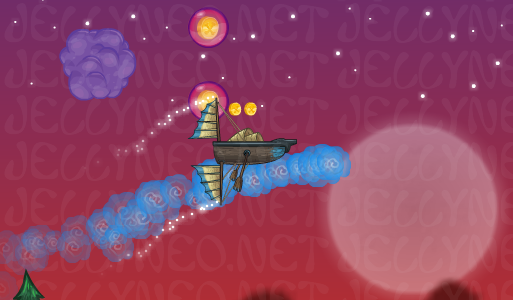 Towards the end of this level there is a mass of pirate ships, all shooting missiles. In this instance there are also no trees or towers. Therefore we suggest staying low with a continuous line of air above you in order to block the missiles. If you are aiming for a high score, the age old rule applies. Try to get as many points as you can in the first level when they are an easy catch. Make use of the scenery button. It is much easier, and much less distracting if you have the scenery turned off. You may notice getting hit by enemies gives you points. Despite this, we do not encourage kamikaze pilots. It is best to refer to tip number one in this case. Always choose a regular cloud over a thunder cloud. Thunder clouds do a lot more damage.